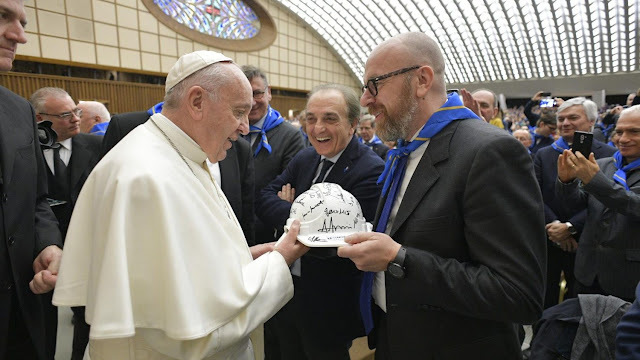 At 11.40 am this morning, in the Paul VI Hall, the Holy Father Francis received the members of the Confederation of Italian Cooperatives at the Audience, on the occasion of the 100th anniversary of its foundation. Welcome you all! I thank your President for the words he addressed to me, in particular for the synthesis he has made of your work and your commitment: he has also grasped what is dear to me, giving us a wise vision of the current context in which we live. And I also thank you for the testimony given by a cooperative that has been able to move forward. Your one hundred year history of action is an important goal, which cannot pass over in silence. They represent a path to be grateful for all that you have succeeded in achieving, inspired by the great appeal of the encyclical Rerum novarum of Pope Leo XIII. In a prophetic way this Pontiff has opened the great reflection on the social doctrine of the Church. His was an intuition that flourished on the conviction that the Gospel cannot be relegated only to a part of man or society, but speaks to all mankind, to make it more and more human. Those in which Pope Leo wrote were difficult times, but every age has its labors and its difficulties. Your story is precious because it comes from having taken the Pope's words seriously and by having made them concrete through a serious and generous commitment that has lasted a century. It is a strong sign of hope when the social doctrine of the Church does not remain a dead word or an abstract discourse, but becomes life thanks to men and women of good will, who give it flesh and concreteness, transforming it into concrete personal and social gestures, visible and useful. Even today the Church does not just need to say the truth out loud; he always needs men and women who transform what the shepherds preach and theologians teach into concrete goods. In this sense, today, saying "thank you" to you for your one hundred years of commitment is also an example for the men of our time, who need to discover themselves not only "takers" of good, but "entrepreneurs" of charity. Your cooperative model, precisely because it is inspired by the social doctrine of the Church, corrects certain tendencies typical of collectivism and statism, which are sometimes lethal to private initiatives; and at the same time, it curbs the temptations of individualism and selfishness typical of liberalism. In fact, while the capitalist enterprise aims primarily at profit, the cooperative enterprise has as its primary purpose the balanced and proportionate satisfaction of social needs. Certainly the cooperative must also aim to produce profits, to be effective and efficient in its economic activity, but all this without losing sight of mutual solidarity. For this reason the model of social cooperative is one of the new sectors on which cooperation is now concentrated, because it manages to combine, on the one hand, the logic of the company and, on the other, that of solidarity: internal solidarity towards its members and external solidarity towards the recipients. This way of living the cooperative model already exerts a significant influence on companies too tied to the logic of profit, because it pushes them to discover and evaluate the impact of a social responsibility. In this way, they are invited to consider not only the economic budget, but also the social one, realizing that it is necessary to contribute to responding to the needs of those involved in the enterprise as well as those of the territory and the community. It is in this way that cooperative work carries out its prophetic function and social witness in the light of the Gospel. But we must never forget that this vision of cooperation, based on relationships and not on profit, goes against the tide with respect to the mentality of the world. Only if we discover that our true wealth is relationships and not mere material goods, then we find alternative ways to live and live in a society that is not governed by the god of money, an idol that deceives it and then leaves it more and more inhuman and unjust, and even, I would say, poorer. Thank you for your hard work, which believes in cooperation and expresses the obstinacy to remain human in a world that wants to commodify everything. And on the obstinacy we felt this sister of ours who gave witness today: it takes obstinacy to move forward on this road when the logic of the world goes in another direction. I thank you for your obstinacy ..., and this is not a sin! Go on like this. But the most important and obvious advantage of cooperation is winning the loneliness that turns life into hell. When man feels alone, he experiences hell. When, on the other hand, he warns of not being abandoned, then he can face all kinds of difficulties and fatigue. And this is seen in bad times. Just as your president recalled that in the cooperative "one plus one makes three", it must also be remembered that in bad times one plus one makes half. So [cooperation] makes bad things better. Our world is sick of loneliness - we all know it - and for this it needs initiatives that allow us to face together with others what life imposes. Walking and working together we experience the great miracle of hope: everything seems possible again. In this sense, cooperation is a way to make hope in people's lives concrete. We could thus say that cooperation is another way of discerning the proximity that Jesus taught in the Gospel. Being next means preventing the other from being held hostage by the hell of loneliness. Unfortunately the chronicle often speaks to us of people who take their own lives driven by desperation, matured precisely in solitude. We cannot remain indifferent to these tragedies, and everyone, according to their possibilities, must commit himself to take a piece of solitude from others. It should be done not so much with words, but above all with commitment, love, competence, and bringing into play the great added value that is our personal presence. It should be done with closeness, with tenderness. This word, tenderness, which risks falling off the dictionary because today's society does not use it so much. Only when we put ourselves into play can we make a difference. For example, it is solidarity to commit oneself to equitable work for all; allow farmers made more fragile by the market to be part of a community that strengthens them and supports them; to a solitary fisherman to join a group of colleagues; to a porter to be inside a team, and so on. In this way, cooperating becomes a way of life. Here: cooperating is a way of life. "I live, but alone, I do mine and go on ...". It is a way of life, a lifestyle. The other one is: "I live with others, in cooperation". It's another lifestyle, and we choose this. In this regard, an episode in the Gospel of Mark comes to our aid: «[Jesus] entered again at Capernaum after a few days. It became known that he was at home and that so many people gathered, that there was no more room even at the door; and he announced the Word to them. They went to him carrying a paralytic, supported by four people. However, not being able to bring it to him, because of the crowd, they uncovered the roof at the point where he was and, having made an opening, they lowered the stretcher on which the paralytic was lying. Jesus, seeing their faith, said to the paralytic: "Son, your sins are forgiven" "(2,1-5). And then he healed him. When we think of this page of the Gospel we are immediately attracted by the great miracle of forgiveness and subsequently of the physical healing of this man; but perhaps another miracle escapes us: that of his friends. Those four men carry the paralytic on their shoulders; they do not remain indifferent to the suffering of their sick friend; they are not camouflaged among the crowd with all the others to listen to Jesus. These men perform a miraculous gesture: they get together and, with a winning and creative strategy, find the way not only to take charge of this man, but also to help him meet the one who can change his life. And not being able to do it through the simplest way, because of the crowd, they have the courage to climb onto the roof and uncover it. They are the ones who open the gap through which the paralytic can approach Jesus and come out of that meeting. The Evangelist notes that Jesus turned to that man "seeing their faith", that is the faith of the whole group: of the paralytic and of friends. In this sense we can say that cooperation is a way to "uncover the roof" of an economy that risks producing goods but at the cost of social injustice. It is defeating the inertia of indifference and individualism by doing something alternative and not just complaining. Who establishes a cooperative believes in a different way of producing, a different way of working, a different way of being in society. Those who found a cooperative have a bit of the creativity and courage of these four friends of the paralytic. The "miracle" of cooperation is a team strategy that opens a gap in the wall of the indifferent crowd that excludes those who are weaker. A society that becomes a wall, made up of the mass of many individuals who do not think and do not act like people, is not able to appreciate the fundamental value of relationships. One cannot really act as a person when one is sick of indifference and selfishness. Then, in reality, the true "paralytic" is not that man they brought by climbing to put him in front of Jesus; the real paralytic is the crowd, which prevents us from arriving at a solution. A crowd made up of individuals who only look at their own needs without noticing others, and thus never discover the full taste of life. Individualism prevents full happiness, because it excludes the other from the horizon. When I remain blind to the suffering and fatigue of others, in reality I remain blind to what could make me happy: you cannot be happy alone. Jesus says in the Gospel with a lapidary phrase: "What advantage has a man who earns the whole world, but then loses or ruins himself?" (Lk 9:25). Dear brothers and sisters, we live in a world that is seized by the frenzy of possessing, and that finds it hard to walk as a community. Egoism is always strong. The work you have been doing for a hundred years is to oppose the relationship to individualism, the team to interest, the well-being of all to the interests of a few. I have already had occasion to tell on other occasions what I was impressed with when I was 18, in 1954, listening to my father speak about this theme. Since then I have become convinced that Christian cooperation is the right path. Perhaps economically it may seem slower, but it is the most effective and secure, the one that goes further. This is why I liked the words of the President, who humbly represent the great commitment that cooperation has made in the country and in the world. In particular, I am pleased to hear that you have visited the existential suburbs where vulnerability lurks more: this is the privileged place of our witness. To insist on the category of the suburbs is due to the choice that Jesus, the Son of God, made in coming into the world. He chose the periphery as the center of his mission. And he did it not only geographically coming into the world in a periphery of the great Roman empire, but he did so by meeting every man put in the suburbs because of poverty, illness and his own mistakes. In this globalized world, we must be in tune with what the social doctrine of the Church teaches when it speaks of the centrality of the person. St. John Paul II explained this well in the Encyclical Centesimus annus. At one point he writes: "If once the decisive factor was the earth and later capital, understood as a mass of machinery and instrumental goods, today the decisive factor is more and more the man himself, namely [...] the his capacity for solidarity organization, his ability to intuit and satisfy the need of others "(n. 32). We should therefore understand the importance of acquiring professional skills and offering permanent training courses, especially to those people who live on the margins of society and the most disadvantaged categories. In this regard, it is mainly women who, in the global world, bear the burden of material poverty, social exclusion and cultural exclusion. The theme of women should return to being among the priorities of future projects in the cooperative sphere. It is not an ideological discourse. Instead, it is a matter of assuming the thought of women as a privileged point of view to learn to make cooperation not only strategic but also human. The woman sees better what love is for everyone's face. The woman knows better how to concretize what we men sometimes treat as "maximum systems". Dear friends, I hope that the past hundred years will open up new and unprecedented levels of commitment before you, always remaining faithful to the root from which everything was born: the Gospel. Never lose sight of this source, and find in Jesus' gestures and choices what can inspire you most in your work. I cordially bless you, encourage you and tell you that I have a lot of hope for what you do. I am sure that it is a well-placed hope. And please don't forget to pray for me. Thank you!